Schengen (L)/Perl (D)/Apach (F) to Thionville: Well established well signposted route. Thionville to Metz: Fairly new excellent well signposted route with a link into the city centre of Metz. 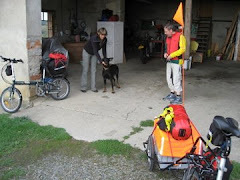 Metz to Pagny-sur-Moselle: Continuation of above route. Follow the bike signs for Woippy from cathedral square and turn off right before the canal bridge to follow the right bank. The route changes from bank to bank but is well signposted as far as Arnaville. The route follows towpaths, forest tracks and minor roads. Once you cross the departmental border into Meurthe-et-Moselle signposting and the smooth tarred path disappears. You can follow a rougher route south to Pagny-sur-Moselle where you can cross the railway lines at a level or grade crossing by pushing the button to warn the signal box of your intention or continue on along a stretch of single track path to reach the new Moselle lock and Pagny-sur-Moselle. It can take a few minutes for the rail track to be clear. South of Pagny-sur-Moselle: I suspect from reading the literature (http://veloroute-charles-le-temeraire.fr/etapes-veloroute-charles-le-temeraire.php) on this route that unless you are an experienced road cyclist that you would be well advised to catch a train in Pagny-sur-Moselle to Nancy. The Charles le Téméraire Cycle Route follows the D952/657 to Frouard and we did not enjoy the route as far as Pont-a-Mousson. Even on e-bikes the traffic was hairy. We researched the route between Metz to Pagny-sur-Moselle as part of the updating of our Riesling Route guide. As the winter weather gets more unpleasant we will retire to our office to update and rewrite the book. Keep your fingers crossed.